Serving Pekin and the surrounding areas in Tazewell county since 1982. Our bread and signature meat sauce are made from scratch daily in our own kitchen. Stop in and try any of our menu offerings at 2996 Court in Pekin, IL. All items are available for prompt carry-out; phone ahead (353-8485) if you wish to pick up your order at our drive-thru pick up window. 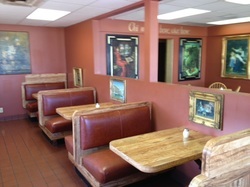 We also offer a dining room for dine-in orders. Although some items are carry-out only, most can be enjoyed in the dining room. Soft drink refills are free while dining. Dining room is open Tuesday thru Saturday from 11 until 8:30. Carry-out orders are available Tuesday thru Saturday 11 until 9.